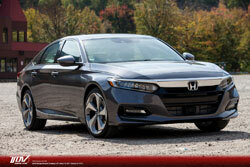 We're checking some of our other sources, but we've recently heard that the introduction of the 2019 Accord probably won't take place until early in calendar year 2019. There's no mention of what (if anything) will be changed, but it will be interesting to see what this means for dealer inventories, as they typically try to sell down the current model year stock a few months ahead of the next model year arrival. We've heard from multiple sources on the dealer side that Honda is still not putting much (if any) incentive cash on the 2018 Accords. With a Civic MMC due for 2019, we kind of have an idea of what to expect as far as the changes (updated infotainment, mild styling tweaks, further expansion of Honda Sensing, perhaps some trim level adjustments), but we're hearing that the arrival of 2019 Civics will be a little later than some had anticipated. We're not quite sure what that means yet but it could be late fall. We are expecting to get some 2019 Civic news in a relatively short timeframe, however. What about the 2019 CR-V?